Rabbi Yannai says: They brought re'em cubs into the ark, and they survived the flood. [The Gemara asks:] But doesn’t Rabba bar bar Chana say: I have seen a day-old offspring of the reima, and it was as large as Mount Tabor. And how large is Mount Tabor? It is forty parasangs. And the length of the cub’s neck was three parasangs, and the place where its head rests, i.e., its neck, was a parasang and a half. When it cast its feces, it dammed up the Jordan river. [So even the cub would have been too large for the ark.] Rabbi Yoḥanan says: They brought only the head of the cub into the ark, while its body remained outside. The Gemara asks: But didn't Rabba bar bar Chana say that the size of the place where its head rests was a parasang and a half? [Consequently, even its head alone would not fit into the ark.] Rather, they brought the edge, of its nose into the ark, so that it might breathe. Just what might be the identity of this mysterious, enormous animal? Let's take a look. But first some background. The word ראם, re'em appears several times in the Hebrew Bible. Here, for example, is a verse from Deuteronomy (33:17) which describes the offspring of Joseph. Like a firstling bull in his majesty, He has horns like the horns of the re'em; With them he gores the peoples, The ends of the earth one and all. These are the myriads of Ephraim, Those are the thousands of Manasseh. These are the animals that you may eat; the deer, the gazelle, the roebuck, the wild goat, the dishon, the antelope, the mountain sheep. Would the wild ox agree to serve you? Would he spend the night at your crib? Can you hold the wild ox by ropes to the furrow? Would he plow up the valleys behind you? So according to the King James Bible, the re'em is a unicorn. Why on earth would the translators have chosen, of all creatures, the mythical unicorn as the re'em? The re'em is a unicorn. Or maybe not. Well, they didn't. They merely followed the Septuagint, the Greek translation of the Hebrew Bible from the third century BCE. And the Septuagint translated the Hebrew re'em as μονόκερως - monokeros, or "one horned". Which is why the King James Bible translated it as a unicorn, from the Latin uni meaning "single" and cornu meaning "horn". And since, according to the Talmud, the Septuagint was created at the command of Ptolemy II by seventy-two Jewish sages, you could claim that the King James translation was following a long Jewish tradition. As Natan Slifkin points out, what Yagel what was actually describing was a rhinoceros: "It was given to King Manuel of Portugal by Alfonso de Albuquerque, governor of Portuguese India. This was the first rhinoceros to be brought to Europe since Roman times, and it caused quite a sensation." Quite so. But before we conclude that the re'em was a rhinoceros, there are a couple of problems. First, although it was once found in the Land of Israel, the rhinoceros remains so far discovered only go back to the Mousterian era, which ended about 35,000 years ago. That's quite a few years before the biblical period. Thus it is very unlikely that there were rhinoceri in Israel in the biblical period. And second, the re'em in the Bible is described as having two horns. Two. "וְקַרְנֵ֤י רְאֵם֙ קַרְנָ֔יו" His horns are like the horns of the re'em" (Deut.33:17). So much for the rhinoceros or unicorn. Artist's rendering of the aurochs. Is this the re'em mentioned in the Torah? From here. Sunday-School Teacher's Bible. Philadelphia, A.J Holman & Co. 1895. p115. Matthew George Easton Illustrated Bible Dictionary. London, T. Nelson & Sons 1894. p678. Of all the animals that have intrigued human beings, perhaps none goes further back in time than the aurochs. 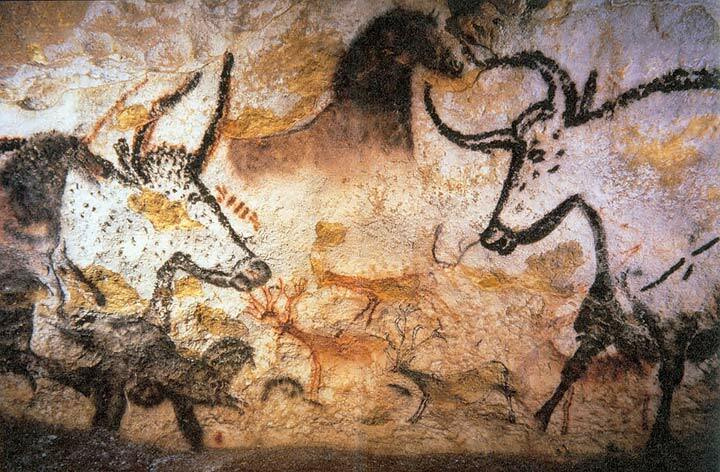 Among the cave paintings of animals found in the Lasaux cave, are aurochs. And these paintings (there are nearly 6,000 of them) are from the Paleolithic period, 17,000 years ago. The largest of the aurochs depicted there is over 15 feet long. 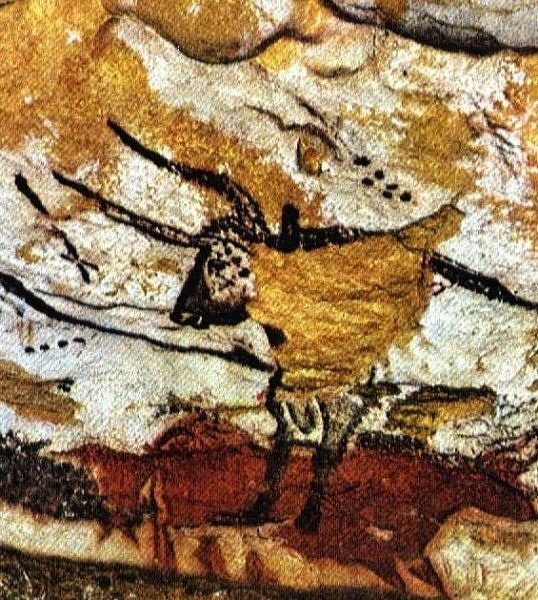 There are similar paintings of the aurochs in another cave system called La-Tete-Du-Lion in southern France, which has been dated to 26,000 BCE. We will, of course, never know with certainty whether the long-extinct aurochs was the re'em. But we have been fascinated with the aurochs for as long as we have walked the earth. What better candidate could there be for the mysterious creature that somehow survived Noah's flood. Detail from the Lascaux cave drawing, about 17,000 years old.